NOTE: This review will contain spoilers if you have not read the book Graceling. 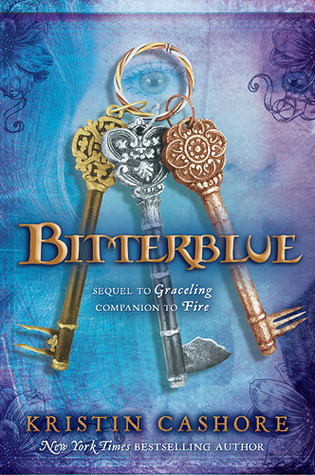 In this book, Queen Bitterblue is 18 years old (8 years after Graceling), and she is still trying to piece together her kingdom from the destruction that her father, King Leck, left behind. As Bitterblue becomes overwhelmed with paperwork for the kingdom in her office, she begins to go out at night in disguise to journey around her capital, Bitterblue City. While out, she meets two new friends- a friendly man named Teddy and his mysterious Graceling/Lienid companion, Saf. Bitterblue learns some quite disturbing information from them: her kingdom is even worse shape than she's been told, and almost nothing they say about Bitterblue City matches what her advisers have told her. Now, Bitterblue must determine who in the castle is lying to her, and why, all the while piecing together parts of the mystery that her father has left behind. May I just say, I love Kristin Cashore's characters. So much. And the first 3/4 of this story was INSANELY. GOOD. But the ending made me really mad. I felt like the end of this story ruined it. It wasn't that something oh-so-terrible happened or that there was some horrid cliff-hanger ending. It just sort of ended. I felt like something was missing, and that Kristin Cashore hadn't really finished telling the story. I feel like I have no clue about what happened to the characters. It's almost as if someone just ripped a couple of chapters out of the back of the book. On the bright side, however, if you were left with any questions as to how the characters in Graceling or Fire ended up, Bitterblue answers those questions extremely well. I was really glad that I got to see how Katsa and Fire ended up. Neither of them were in the story a whole lot (sadly), but it did put to rest any questions about their fates. So, Bitterblue was an extremely good book with lovely characters. It answered any questions you may have had about the ending of the first two books in the Graceling realm, but it left you with an entirely new set of questions as to how things are going to end up for Bitterblue. It really was a great story, but I just feel as if Cashore just left so much missing that the book didn't feel complete at the end. Thanks, Rosie! So glad you like it :) I'll check yours out as well.